First the Desert Madman, then the Jungle Drug Lord... now a new evil challenges the Strike C.O.R.E. right here in America! Ruthless media mogul and political maverick H.R. Malone secretly plans to destabilize the U.S. government. Crush this rebellion at all cost! Another helicopter shoot-em-up in the Desert Strike tradition. This time, the evil psycho villain is a Presidential hopeful who lost his grip on reality when he lost the election. 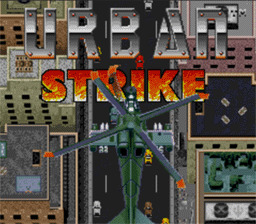 Urban Strike takes you to various destinations around the United States, following his movements and foiling his schemes to cripple our civilization.